Life History of Plocamium sp. Plocamium has a typical Floridean life history comprised of three stages, summarized in the picture above. The Bangean life history is very different, and is summarized at the end of this page. The gametophytes of Plocamium are dioecious, which means that there are separate male and female individuals. These produce gametes, which fuse to create the second life history stage called the carposporophyte, which is tiny and lives inside the mother. This carposporophyte produces spores that grow up into the tetrasporophyte, which looks just like the gametophytes. The tetrasporophyte then produces tetraspores in sets of four, two of which grow up into male gametophytes, and two of which become female gametophytes. This whole process is described in much greater detail below. Cross section of carpogonium in Plocamium. The first of of the three stages in the the Floridean life cycle is the gametophyte, which produces gametes (eggs and spermatia). The eggs are called "carpogonia" and look like bulbs with a long hair (trichogyne) that sticks out of the thallus, or body of the alga. A sperm, in the red algae, is called a spermatium because it lacks a tail (flagellum) with which to swim. Therefore, the spermatium needs to rely on water motion to carry it to the trichogyne (hair) of the carpogonium (egg cell). When the spermatium lands on the trichogyne of the carpogonium, the cell walls fuse, and the nucleus of the spermatium travels down the tube of the trichogyne. 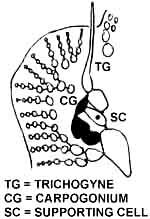 Karyogamy, which is the fusion of the two nuclei, occurs in the lower bulb of the female carpogonium. This carpogonial cell can now be thought of as a zygote, which is the first cell of a new thallus. This zygote is also diploid (black cells in the picture at left), which means it has twice as much DNA in its nucleus than either of its parents did (those were haploid, and are white in the picture). Sexual individuals are infrequent. When they do occur, they are more often found growing on other algae (epiphytic) or on other animals (epizoic), than on rock (epilithic) (Kain 1984.) Spermatangia (structures that produce spermatia) are not useful in identifying a species. Carpogonia, containing the carpogonium (egg) and the trichogyne (hair on egg) are in bulges of ~1mm diameter on female gametophytes. (South & Adams 1979). 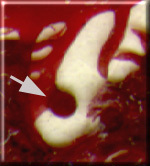 The carpogonium is at the end of a carpogonial branch, which is composed of 3 cells and an auxiliary cell. In Plocamium it is this so-called auxiliary cell, not the carpogonium, that becomes the zygote. This can happen because the two nuclei that have fused are transferred to this auxiliary cell before cell divisions start creating the carposporophyte. (Chapman & Chapman,1973). Cystocarp (which contains carposporophyte) on branch of Plocamium. Cystocarp surrounding carposporophyte on Plocamium. The next phase of the Floridean life cycle is unusual compared to normal plant life cycles. Two things occur simultaneously. While the female gametophyte grows more tissue around the carpogonium, embedding it, the zygote itself undergoes many cell divisions, creating a filamentous structure composed on thousands of zygotes, all strung together. 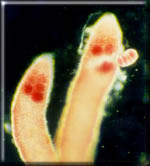 This tiny filamentous diploid structure, living within the haploid tissue of the female gametophyte, is what is referred to as the carposporophyte. 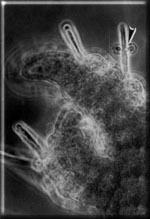 The cells at the tips of the individual filaments of the carposporophyte can be converted into carpospores that are released into the water. The next cell down on the filament then undergoes the same conversion, and is also released into the water. In this way, one fertilization event can produce thousands and thousands of carpospores. This is important for an organism that relies on random water motion to carry a spermatium to the trichogyne of a carpogonium (which can be a rare event). While the carposporophyte is growing, the surrounding tissue from the female gametophyte divides rapidly to form a hollow ball, called a cystocarpic envelope, or simply a cystocarp. This globular cystocarp is solitary and protrudes from the higher branches. These carpospores, like all spores, can grow up into adult individuals without fusing with other spores. This is normally how asexual reproduction works. However, in this case, the carpospores don't grow up to become adult carposporophytes (which live in the mother, remember). Instead, they grow into tetrasporophytes, which are free living adults that look just like the adult gametophytes (which we started with). These tetrasporophytes produce tetraspores via meiosis, which is a process of cell division that creates four cells, each with half as much DNA as the individual that created them. Tetraspores can be either zonately, tetrahedrally or cruciately divided (see below). These tetraspores, once again, don't grow into the same form as the individual they came from. 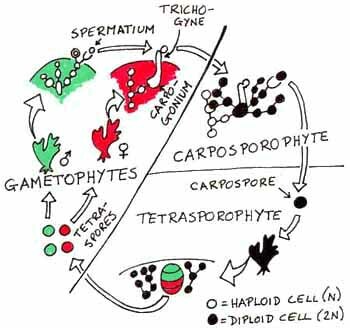 Instead, half the tetraspores grow up into female gametophytes (which later bear carpogonia - eggs), and the rest of the tetraspores grow up to be male gametophytes (which later release spermatia - non-motile sperm). Tetrasporophytes grow from carpospores, which were released by the carposporophyte that was living in the female gametophyte. When these tetrasporophytes mature they grow specialized small branchlets, called stichidia. In Plocamium pacificum, the stichidia have very long, slender branches, which give this life phase a more bushy appearance. Certain cells in the stichidia undergo the process of meiosis to produce zonate tetraspores (like four stacked disks) (Drew 1951). Each disk of the zonate tetraspore is really a single spore cell. Two are female, and the other two are male. These tetraspores can each grow into a full-fledged gametophyte, which completes the life history cycle. Tetrasporophytes are often the dominant life history stage. In the Isle of Man, Kain found that 99% of Plocamium individuals were tetrasporophytes (1984). The Bangean life history is usually diphasic, which means it has two stages. These alternating generations can either be produced sexually or asexually. Porphyra is a good example. The large fleshy phase is free living, and is used as nori in sushi. The other phase is a very small filamentous form that lives within the walls of shells, and is therefore called the conchocelis (conch = shell). The fleshy stage is composed of a parenchymatous sheet which is one cell thick. These cells can do either of two things. They can clone the large plant by converting themselves into monospores which grow back into a genetically identical adult, or they can reproduce sexually. In the sexual cycle, some of the cells in the big fleshy stage are converted into spermatia, which are the male reproductive cells. These spermatia then fertilize the normal, general cells of the parenchymatous sheet (not egg cells), or they fertilize general cells that have been converted into carpogonial cells (egg cells). In either case, these fertilized cells, called carpospores, settle on shells and bore down under the surface where they then live as the tiny, filamentous conchocelis phase. Finally, the conchocelis phase bears conchospores (which are really tetraspores) that grow into the large fleshy stage again. This completes the cycle. At first these two phases were thought to be different species. The discovery of this life cycle has revolutionized the seafood industry in Japan. Now high quality stocks of the conchocelis stage can be stored. The "nori farmers" can induce conchospore production at will. They let the conchospores settle on (attach to) nets that are later placed in the ocean until harvested. In Japan, a single sheet of quality nori can fetch $50 (Goff, Lectures 1999).